A while back I wrote briefly on the "denessiefication" of one of the Loch Ness exhibition centres as a more sceptical line of inquiry emerged and the centre also moved towards a more holistic approach to telling the story of Loch Ness (as the two brochures separated by 30 years shows below). I was rummaging through some old stuff recently and found some more material which merited this article. To give you some background, entrepreneurs have always sought to cash in on the Nessie story since the story broke big time in 1933. 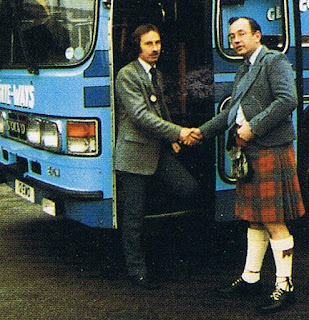 Popular Nessie style postcards soon appeared, special bus services were laid on and adverts with strange looking Nessies endorsed products (well, nobody owned the image rights to the Loch Ness Monster). 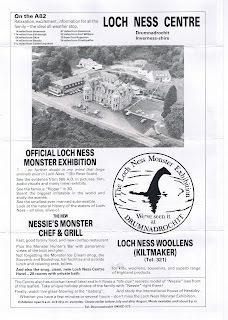 However, the genre of "Exhibition" as a business in its own right did not properly appear until the second wave of Nessie mania in the 1970s (the Loch Ness Investigation Bureau from the 1960s also ran a small visitors centre at its HQ though I do not recall if it was pay to view or voluntary donations). 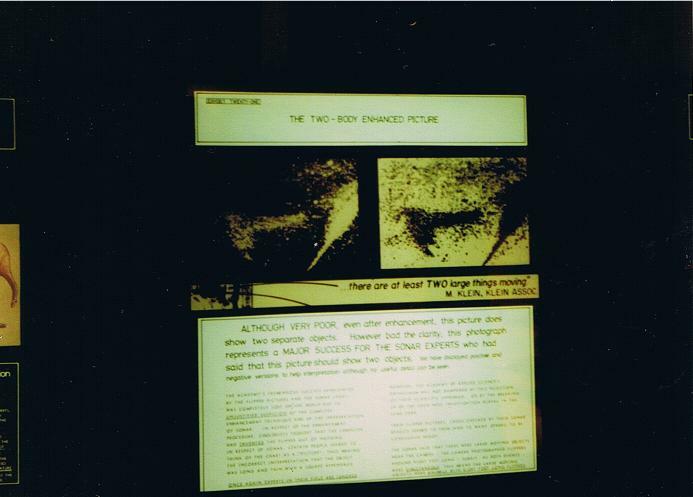 At that time there were three of four exhibitions on the go competing for the the new surge in the tourist pound. In the village of Drumnadrochit by Urquhart Bay was the "Original Loch Ness Monster Exhibition" and the "Official Loch Ness Monster Exhibition". I don't know why one though it was "original" and the other thought it was "official". 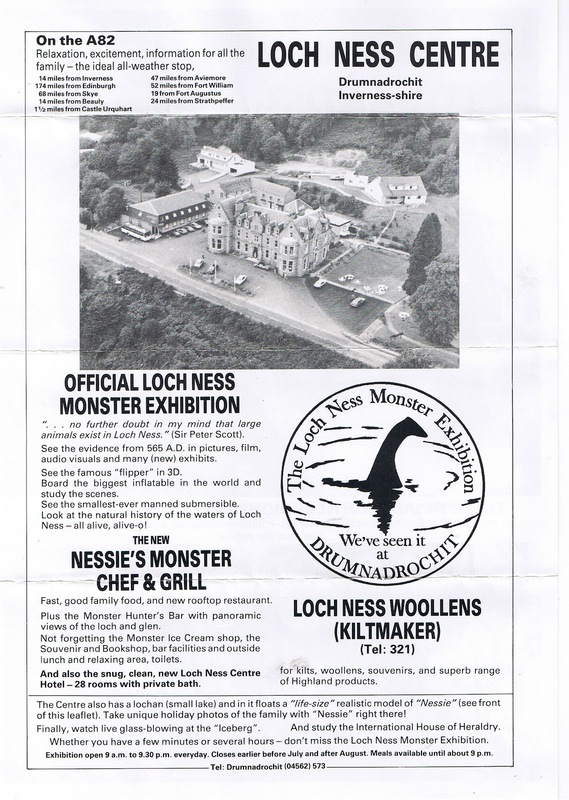 They recently came to an agreement on names and these days they are the "Nessieland Castle Monster Centre" and "The Loch Ness Centre". 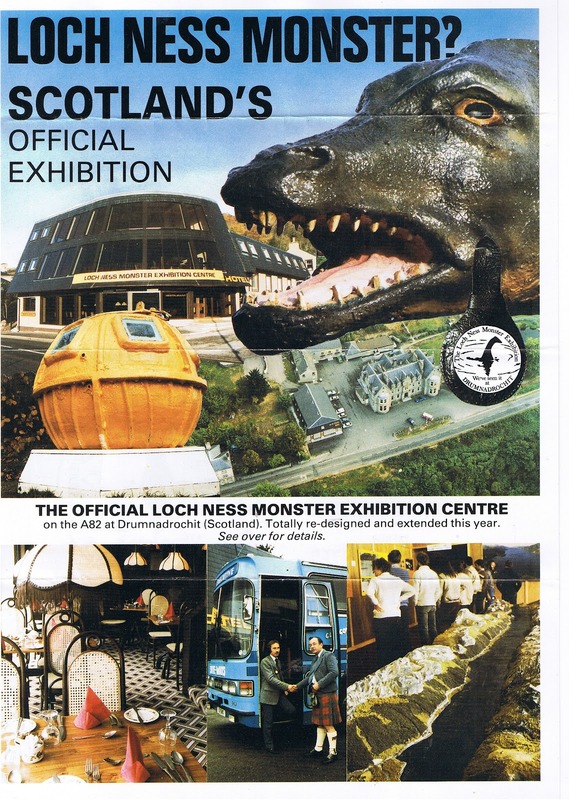 There was also the "Great Glen Exhibition" in Fort Augustus which had a Nessie section but I am not sure if it survived into the 1980s. And then there was Frank Searle's exhibition of which more at the end. 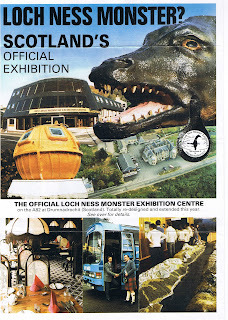 Amongst my old Rip Hepple nessletters I came upon this flyer for the "Official Loch Ness Monster Exhibition Centre" from the early 1980s.You can click on the images to enlarge and read the text but it is pretty clear it was a "believer" oriented place at that time (like all the others). The other "monstrous" sight you would see at Loch Ness was that of an Englishman wearing a kilt. I am only kidding, Tony. The man exposing his knees to the world is Tony Harmsworth, the designer and curator of the "official" exhibition. He now distances himself from that exhibition since he became a Nessie Atheist and at best believes Nessie was/is a sturgeon (a theory itself not easy to prove). Though he still runs a tour bus and tells the tourists his own tales of Loch Ness. So I found some photographs I had taken of various exhibitions in the early 1980s but to my chagrin I did not write on the back their location. So I am not entirely sure 30 years on what exhibition is which. I think the first three are from the "Original" exhibition but feel free to put me right on that. The first is a model of the ubiquitous plesiosaur genre. It is not surprising this theory held sway with exhibitors, the idea of an antediluvian dinosaur ploughing the depths of Loch Ness was more likely to bring them in than a giant worm or eel! Another plesiosaur-type exhibit, this time a painting executed by the late William Owen who was involved with the "Great Glen Exhibition" though I think this painting may have moved elsewhere by then. Topical to see a Nessie on land painting as I currently work my way through a series of articles on land sightings! The artist looks like he/she is called "McCutcheon" but that is as much as I know. Perhaps someone could add a comment about this artist and any other similar work? This darkened exhibit below I am sure is from the "Official" exhibition as I recall it being a dimly lit affair but I could be wrong. It describes the "two-body" underwater picture taken by Robert Rines and his team and the narration proclaims how the sonar which went off at the time predicted there should be two objects in the area of the strobe shot. That sounds like an article in its own right! But for sheer class, individualism and no expense spared we have Frank Searle's own exhibition on the other side of the loch on the shores of Foyers. Now I am sure there are plenty of photographs of this little exhibition tucked away in tourist albums but I have to date seen no pictures on the Internet, so here for the first(?) time is a look inside Frank's display. As you can see it was a rather humble affair in terms of appearance but not in terms of ego as Frank very much publicised himself as well as the monster. He used an old caravan in which he erected these panels. The photographs and newspaper clippings were covered over by some protective polythene and he added his own comments in the small white pieces of paper you see. The panel to the left consists of his photographs while the panel facing us consists of newspaper clippings. The headlines are bit too far to make out but the main photo on the clippings is certainly a scene from "The Private Life of Sherlock Holmes" when the "monster" attacks their boat. The other head and neck picture above that is interesting but it is probably a drawing rather than a photograph. Unlike the other exhibitions, Frank did not charge admission, which is hardly surprising considering the minimal investment that went into it. I think I do recall a donations box being visible somewhere. Shortly after this, Frank Searle left Loch Ness. His exhibition was "decommissioned" by persons unknown who tipped the entire caravan into the loch. 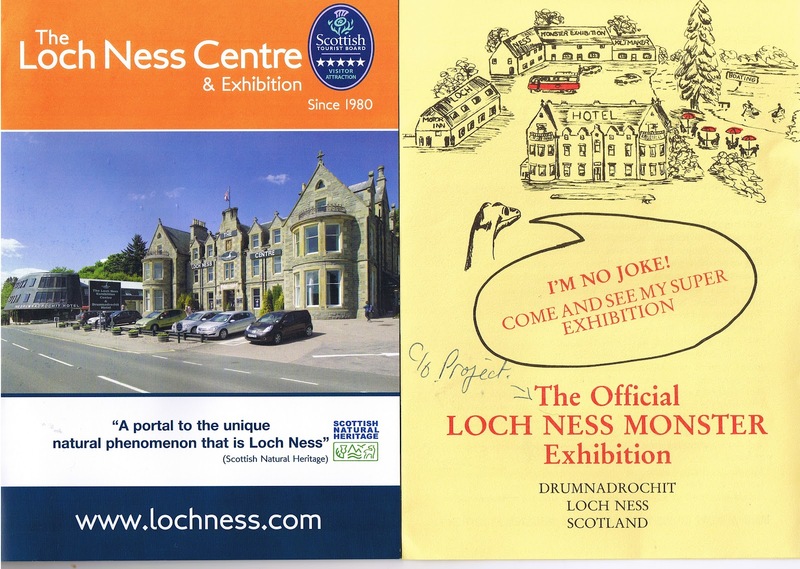 Today, the two main exhibitions continue at Loch Ness.The Loch Ness Centre certainly appears to be doing well with 300,000 vistors in one year recently. At £5 a person, that's £1.5 million ($2.3 million) and that doesn't include the gift shop and other merchandise. Just imagine the income when the monster's existence is finally proven!